One of the things we've been trying to do a lot around here is differentiate this space by trying different things. Well, let the track record be darned as we try another renewable post topic. * Presumably, the best parts of this topic is that it'll be fun to write and potentially useful to fantasy players and reality fanatics. *Please, no worries, "Player of the Fortnight" isn't going anywhere. We unveil the curtain, and our idea is: Whom would we pickup if we were streaming hitters or pitchers? Best FA pickup of my career? I've been in leagues where it is advantageous to play matchups, or ride a hot streak, and add/drop a player just about everyday instead of having your team's worst player in your lineup day in and day out. I may never forget the best free agent pickup that I've ever executed. 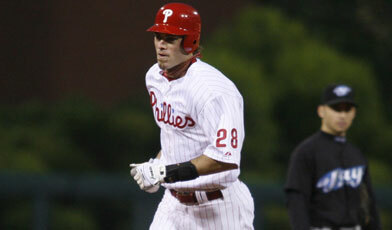 It was May 18, 2008, and I picked up part-time player, but lefty masher, Jayson Werth, as his Phillies were at home facing the lefthanded David Purcey. Werth promptly exploded for 3 Homeruns and 8 RBI's. It's more common to see this phenomenon with Starting Pitchers than hitters, but we will show an option for both. League circumstances vary, and we don't want to be forced to go too deep into the free agent ranks, thus ignoring better players who are available in your league. What's the right number? We'll leave it to the readers to decide. Comment below, tweet at me, or email baguilers *at* gmail what ownership percentage is best. For this inaugural post, and until we hear from y'all, let's say that we can only consider players available in over 76% of ESPN and Yahoo leagues. If they're available in more than 76% on one site, but nor the other, they're ineligible. In other words, they must be owned in less than 24% of leagues on both websites. So, if we're looking at the Free Agent wire for tomorrow's game, and we need a batter and could use another pitcher, whom would we add? If you need a pitcher for tomorrow's games, there isn't much to choose from in the under 25% ownership range. I may say roll the dice with Freddy Garcia @ Detroit, but that is playing with fire. 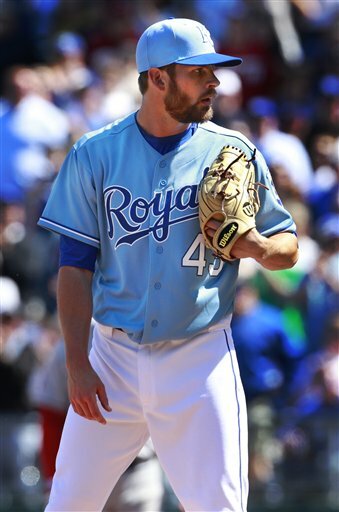 We've always touted electric arms from the SP/RP position; Aaron Crow is no different. So far this season, Crow has pitched 14.3 innings with 14 strikeouts, 2 wins, a 0.00 ERA, 2.06 FIP, and 0.84 WHIP. His pitch values are high, and his 0.4 fWAR reflects that his performance this season, to date, has already been worth $1.9 million on the free agent market. That's not bad, at all, for one months work from a set up relief pitcher. On the other hand, ZiPS projects a 6.64 ERA and 1.86 WHIP for the rest of the season. Clearly, it's my humble opinion that while ZiPS doesn't like Aaron Crow, ZiPS doesn't know Aaron Crow. We were going to say Brett Wallace of the Astros. We've mentioned him over and over, and his ownership has risen steadily. His tripe slash line, so far, this season is .382/.450/.517, and while his numbers will regress downwards, he is still learning on the job. Finally, fantasy players are starting to take notice as his ownership percentage has risen to 27% on both ESPN and Yahoo. Cash in on a hot bat. For almost two years, smart baseball guys like Dave Cameron have been yelling to "Free Seth Smith". I'm not sure that he is going to take an everyday job and run with it, but Dexter Fowler sure hasn't been getting it done. If you're reeling from the loss of Jose Tabata, outfielders like Smith, Josh Willingham, or even Corey Patterson may be your next contributor. Smith has a decent chance of starting tomorrow night, and it's a good matchup. Barry Enright has difficulty retiring Major League hitters, and the D'Backs ballpark inflates production from left-handed hitters. Future blog post Spoiler Alert: I'm going to look for an old script of "Soap" because I would love to mimic their introduction and conclusion narration with gems like, "What will happen next? Will Benson discover that Billy is up to no good?" I don't know. Anyway, like I said, I need to find an old script. Yeesh. Until we meet again, thank you for all the love.